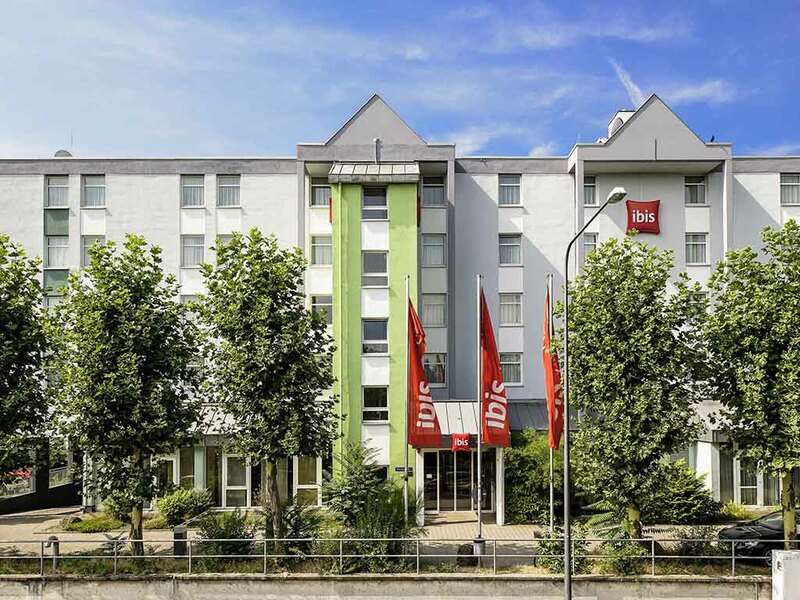 Hotel ibis Frankfurt Messe West. Book your hotel now! Discover peace and relaxation at the ibis Hotel Frankfurt Messe West; just what you need after an eventful day in the busy city. Our hotel is located in the west of the city, about 2.5 miles (4 km) from Frankfurt exhibition center. Thanks to excellent transport links, you can reach the city center in just a few minutes. The hotel has 114 air-conditioned rooms with innovative, unique and comfortable beds, plus a conference area for your events. You can park in the indoor or outdoor car park at the hotel. Relaxing moments and quiet evenings in Frankfurt: The ibis Hotel Frankfurt Messe West has 114 air-conditioned rooms. Soundproofing and brand-new beds ensure that you get a restful night's sleep. Includes flat-screen TV, WIFI access and desk. You can decide when to relax, but for any time in between, you can always visit our bar which is open 24 hours a day. Refresh with a cold beer or your favorite drink, or satisfy your appetite with a snack. Free WIFI access is available. The receptionist one night was talking on his own Handi, on speaker, and he was not wearing an Ibis uniform, instead he was wearing an untucked shirt. This was either Jan 18th or 19th. When I bought a water, he stood very close to me, awaiting my payment, in an aggressive manner, though he may not have realized this. The cleaning lady sometimes forgot to put a bag in the trash bucket after collecting it. Cleaning lady did not remove finished bottles of water from the room. GOOD AND COMFORTABLE HOTEL. EASY ACCESS TO PUBLIC TRANSPORT. CLEAN. REASONABLE BREAKFAST. I HAVE BEEN STAYING HERE ONCE EVERY YEAR SINCE LAST 7 YEARS AND DON'T FEEL LIKE SWITCHING TO NEW HOTEL. Room, breakfast and service were OK.
Our group had a good experience at this hotel. Rooms were nice and clean. Everyone liked the breakfast! Very good reception, excellent room (location at the back of hotel, very well equipped), car par - a pleasure to see them again! Although we did not check in on-line, checking in was very smooth. We got a very nice room, quiet, clean and well equipped, particularly an excellent bed much required after a long night of partying. The car park was very well organised, we could go in and out at well (ticket valid for the whole stay) however a bit pricey given that in the weekend that part of the city (mainly business buildings) was as good as empty. We did not breakfast because we needed to drive back home quickly however it was also true that we find it a bit too expensive in comparison to alternatives (McDonalds). Perhaps two kinds of breakfast might provide a better solution: a continental one (coffee and croissants) and a full english breakfast (made to order for instance). few minutes from S-bahn station, which runs frequently. A perfect end to an exhausting journey! We've stayed here several times and have enjoyed every stay. We ask for a quiet room and that 's what we've had . This coupled with the very effective curtains and comfortable bed ensured we slept well. The housekeeping staff kept our room spotless throughout our stay. We enjoyed the buffet breakfasts and if you book these with your room on-line you can save money. Five relatives joined us for breakfast on Sunday. A great selection of food with relaxed efficient service from the breakfast staff. Reduced charge for child's breakfast even though I think my 9 year old grandson probably ate more than anyone else!We found the multilingual bar and reception staff polite efficient and helpful.Whenever we passed a member of staff in the hotel they always said "hello".It was nice to see some familiar faces among the staff . They seem to be a good team . Dare I say almost like a happy family.We will soon be back. Standard hotel, met my whole expectations. Everything was very standard. At least I expected this when booked. With Ibis one will never fail accommodating. Clean, comfortable, sufficient number of services, competitive price and location. Parking. Everything I needed, plus they kept my reservation three more hours. I was late travelling from Milan by car. Renovations may be of need. Floor carpets in corridor are looking very old due to strange colour scheme. In fact carpet is new. Overall OK but wanted to charge me more than I booked for (was easily rectified but still not correct) and very very limited Ibis breakfast in comparison to other Ibis Hotels (I am a gold le club member and stay regularly in one of them). Wonderful. As expected and better. Very good overall experience. Smoke from smokers immediately outside the front of the hotel was the downside. Receptionists polite and helpful. Hotel clean. Sleep quality very good (blackout curtains, thick windows that blocked out all the noise). Thankfully our rooms were away from the elevators which ARE noisy: hint to anyone booking: ask for a room away from the elevators! Hotel is a one minute walk from the Industriehof U-bahn station which gives you fast and reliable connections into the city. The one really negative thing is having to walk through a crowd of smokers at the front door. PLEASE move the smoking area somewhere else. Guests should not feel imprisoned by smokers!! Came late and left early. Received great service from the reception when I needed to charge my car. Very good, great location, decent price and clean. Able to access public transportation easily and a protected parking area which was nice even though it was 11 euro per night. I would stay there again.